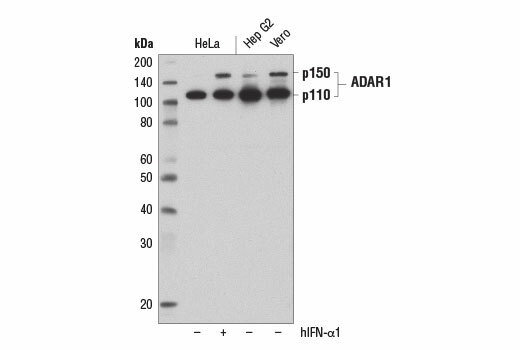 Western blot analysis of extracts from HeLa cells, untreated (-) or treated with hIFN-α1 #8927 (+), and Hep G2 and Vero cells, using ADAR1 (D7E2M) Rabbit mAb. ADAR1 (D7E2M) Rabbit mAb recognizes endogenous levels of total ADAR1 protein. Monoclonal antibody is produced by immunizing animals with a synthetic peptide corresponding to residues surrounding Trp454 of human ADAR1 protein. Post-transcriptional processing of RNAs such as RNA editing is an important mechanism by which diversity in RNA and protein is achieved that is not otherwise encoded by the genome (1,2). The most common form of RNA editing is the conversion of adenosine (A) into inosine (I) on double stranded RNA by the adenosine deaminase acting on RNA (ADAR) family of proteins (1-3). Since inosine base pairs with cytidine, it is interpreted as a guanosine by the splicing and translational machinery leading to alteration in the protein sequence, as well as splicing isoforms being generated (1,4-6). A-to-I editing can also influence RNA sequence recognition by RNA binding proteins and non-coding RNA, such as miRNAs, affecting subsequent RNA processing, stability, and protein expression levels (2). ADAR1 is ubiquitously expressed with two known isoforms ADAR1L (p150) and ADAR1S (p110) resulting from transcription using alternative promoters and start codons. ADAR1S is constitutively expressed in the nucleus, while ADAR1L is interferon-inducible and present in both the nucleus and the cytoplasm. The induction of ADAR1L in response to cellular stress and viral infection suggests a role for RNA editing in the innate immune response (1,7). In addition, ADAR1 is essential in mammalian development, particularly in hematopoiesis and suppression of interferon signaling to protect hematopoietic stem cells from destruction in the fetal liver and the adult bone marrow (8,9). Zinshteyn, B. and Nishikura, K. (2009) Wiley Interdiscip Rev Syst Biol Med 1, 202-9. Nishikura, K. (2006) Nat Rev Mol Cell Biol 7, 919-31. Bass, B.L. (2002) Annu Rev Biochem 71, 817-46. Reenan, R.A. (2001) Trends Genet 17, 53-6. Maas, S. et al. (2006) RNA Biol 3, 1-9. Rueter, S.M. et al. (1999) Nature 399, 75-80. Patterson, J.B. and Samuel, C.E. (1995) Mol Cell Biol 15, 5376-88. Iizasa, H. and Nishikura, K. (2009) Nat Immunol 10, 16-8. Hartner, J.C. et al. (2009) Nat Immunol 10, 109-15.